Reduced saturated fat (SFA) consumption is recommended to decrease coronary heart disease (CHD), but there is an absence of strong supporting evidence from randomized controlled trials (RCTs) of clinical CHD events and few guidelines focus on any specific replacement nutrient. Additionally, some public health groups recommend lowering or limiting polyunsaturated fat (PUFA) consumption, a major potential replacement for SFA. The overall pooled risk reduction was 19% (RR = 0.81), corresponding to 10% reduced CHD risk (RR = 0.90) for each 5% energy of increased PUFA. These findings provide evidence that consuming PUFA in place of SFA reduces CHD events in RCTs. This suggests that rather than trying to lower PUFA consumption, a shift toward greater population PUFA consumption in place of SFA would significantly reduce rates of CHD. The long history of dieting fads: "soap should be eaten for its diuretic properties", wrote a prominent surgeon in 1810. Lancet, 2012. 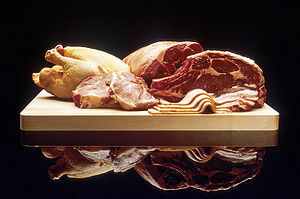 Image source: Varieties of meat, Wikipedia, public domain.